December darkness can be alleviated with some Christmas lights in most cities in Europe. From Sweden, and most places in Europe, it is easy to reach both Hamburg and Copenhagen. You can travel both with the Swedish train companies SJ and Oresundstag over to Copenhagen. We took the direct train with SJ from Stockholm to Copenhagen. It took us 5 hours to travel between the city centers. We were only visiting Copenhagen for one evening and night. It was practical to find a hotel near the train station to easily go travel on to Hamburg the next morning. Ended up at Comfort Hotel Vesterbro just a few hundred meters from the station. Good rooms, friendly staff, and a fantastic breakfast. The bathroom could use some renovation. But all in all, it was very good and great value for money. You can easily walk between the Christmas markets in Copenhagen. We did only visit those we knew were in the center, so we may have missed some outside. 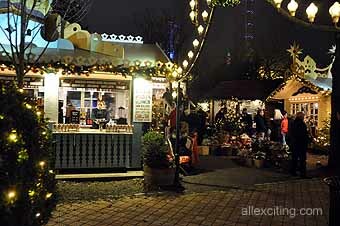 The most famous and well-known is the Tivoli Christmas Market. Tivoli in Copenhagen is a big funfair area, nicely decorated for Christmas in December, just outside the central train station. Other good Christmas markets are the ones at “Kongens Nytorv” and at “Nyhavn”. To reach them, you just walk through the shopping street Stroget from the central station. At the end, you find Kongens Nytorv and further from there you come to Nyhavn, a nice area with many cafes and good restaurants. On the way through the city, we stumbled upon some smaller markets as well. Copenhagen is a nice city to explore and has a cozy atmosphere. A full report will be on a separate page for the Christmas Markets in Copenhagen, with more pictures and info. After a great breakfast at Comfort Hotel Vesterbro, it was a short walk to Copenhagen train station. It is always a pleasure to enter the comfortable German ICE trains. Great seats and good service. If you book well in advance you can get really good prices, even on a first-class ticket. It only takes about five hours to travel between Copenhagen and Hamburg by train. This includes a ferry crossing from Roedby in Denmark over to Puttgarden in Germany. The train rolls onto the ferry. All passengers have to leave the train and go upstairs. It is a good idea to bring anything of value with you and remember the deck number and letter of the stairs when you leave the train. On board the ferry, you’ll find cafes, restaurants, and shops open during the crossing. When the coast of Germany comes closer it is time to go down to the train again. 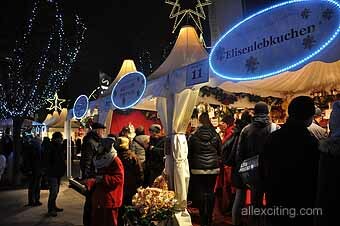 Despite Hamburg being a big city, it is possible to walk between most of the central Christmas markets. We visited eight markets and had two fantastic days in Hamburg. All the way from the train station through the shopping street, Mockenbergstrasse, it looks like one long Christmas Market. Lots of things to look at and many goodies to taste. After strolling through it all you come to the City Hall “Rathaus” where you find a big and beautiful Christmas market. You can discover other markets, such as the one at Youngfernstieg and the very popular one at the Reeperbahn. 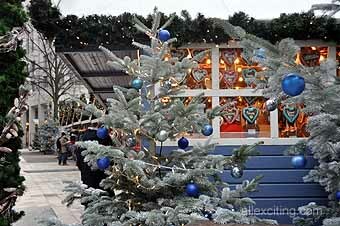 See an overview of the markets at our Christmas in Hamburg page.